Pancake artists, you need to up your game. 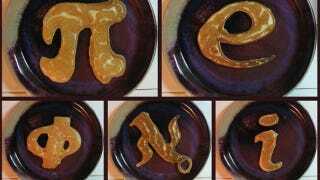 Nathan Shields, an illustrator and former math teacher, is turning fried batter into an art form. In order to be a full-time dad, Shields is taking a break from teaching, but his math background — he still blogs about it at 10 Minute Math — is influencing his parenting. What else can explain his creation of edible fractals and mathematical constants? Oh, you prefer biology? Then chow down on some marine invertebrates, or perhaps a few human organs. An archaeologist at heart? Try his dinosaurs. (Yes, I appreciate the inclusion of a chicken in that set.) Entomology? If Shields can detail the spines of a sea urchin, you better believe that he can cook up insects' legs as well. And for the geeky cherry on top, take a bite out of Darth Vader. For more, including reptiles and dogs, check out Shields' website, Saipancakes. The name is a play on Saipan, the biggest of the Northern Mariana Islands (a U.S. Commonwealth located between Hawaii and the Philippines) and the one where Shields lives.